Probably many of you dream of admiring the sunrise and the sunset on Mount Nemrut and some lucky people would have had such an opportunity. 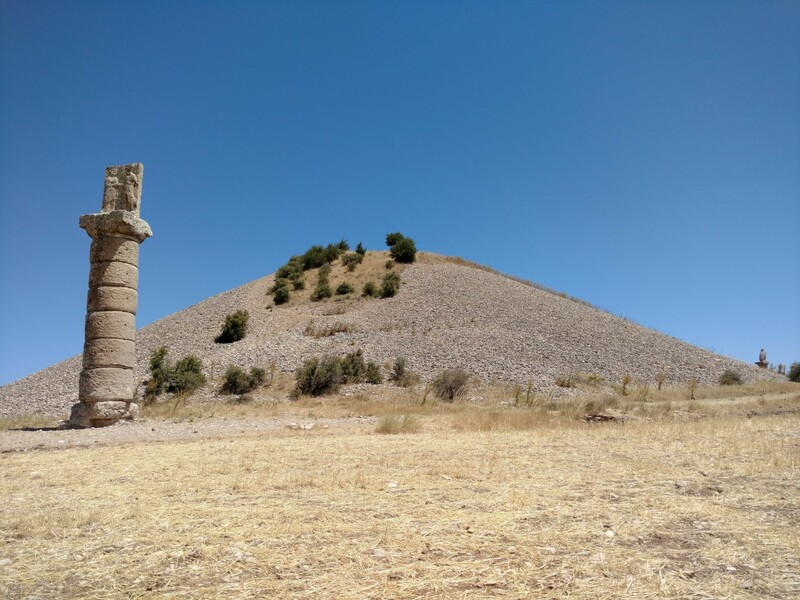 Meanwhile, not far from the majestic Nemrut Mountain rises a much lower hill, whose peak is known as the Karakş Tumulus. 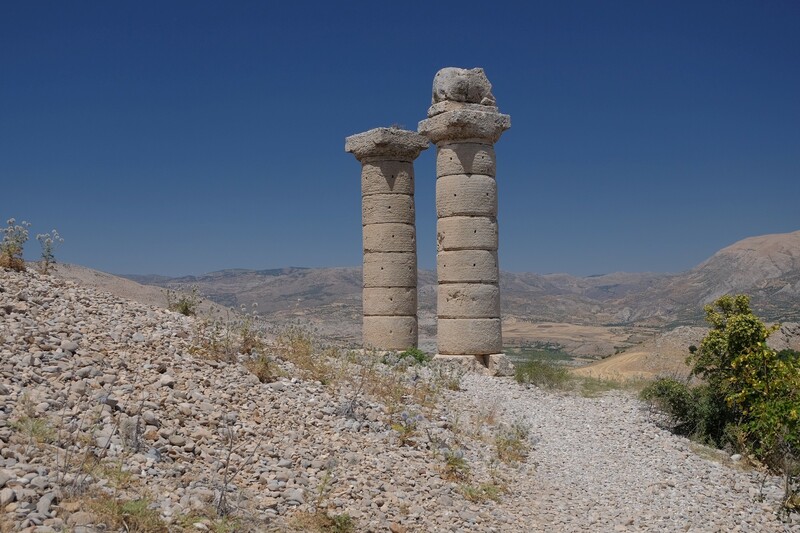 A visit to this place will not substitute the experiences from Nemrut but can be a perfect complement to them. 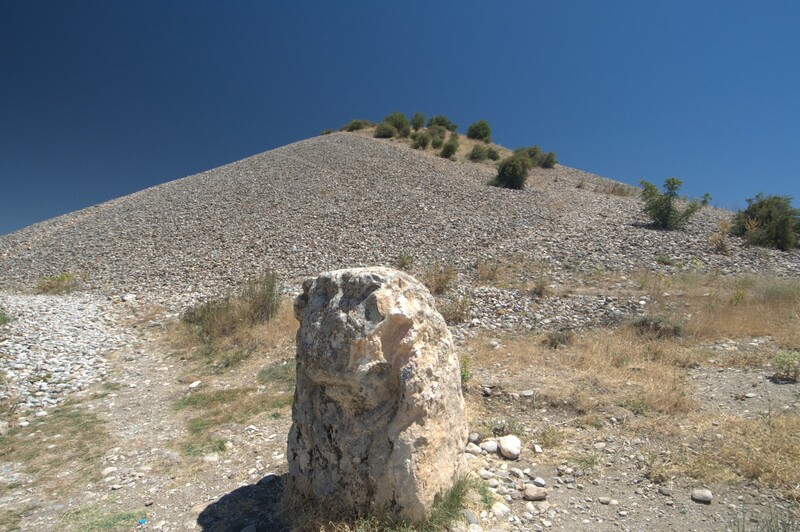 As in the case of Mount Nemrut, the Karakuş Tumulus is an artificial mound, 35 meters high, located on the top of a natural hill. 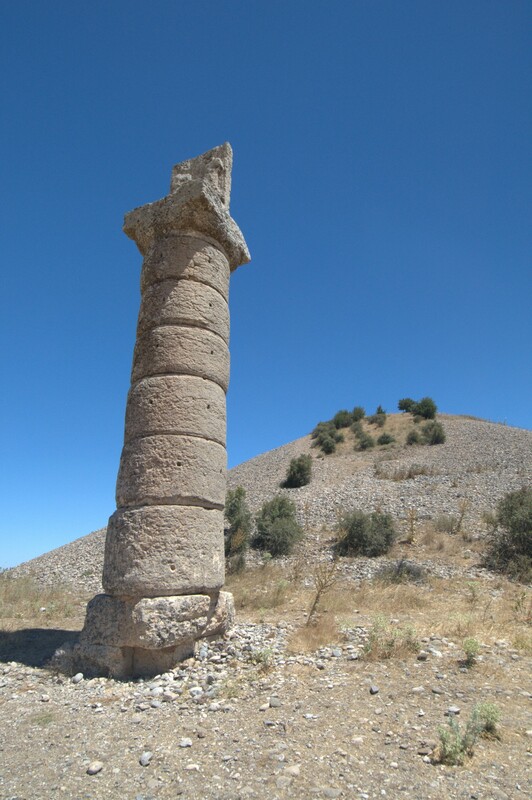 Its Turkish name means "Black Bird", and its origin is explained by the column standing at the tumulus, the top of which is decorated with the sculpture of an eagle. It welcomes visitors to the tumulus, arriving there by the path from the south. 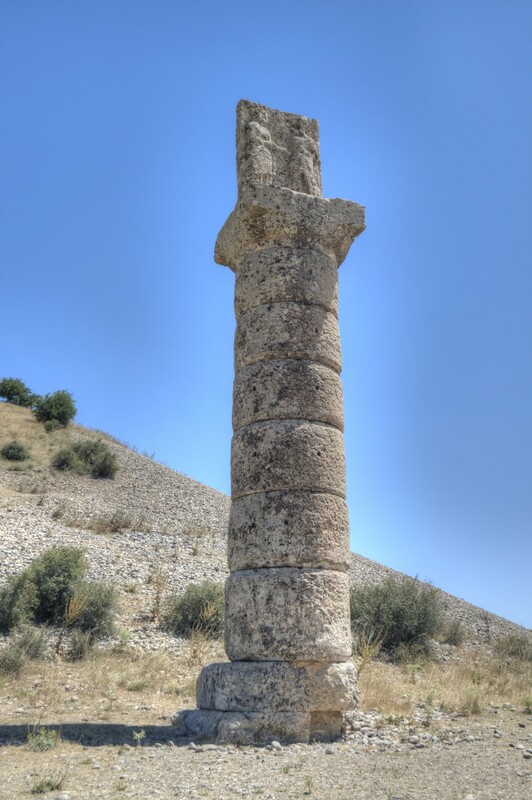 "This is the hierothesion belonging to Isias, whom the great king Mithridates (she was his own mother) [...] considered worthy in this last hour. [...] Antiochis lies here, the sister of the king of the same mother, the most beautiful of women, whose life was short but the honours - longlasting, Both of them, as you can see, supervise this place, together with the daughter of the daughter, the daughter of Antiochis, Aka. The monument to the life of each of them and to the honour of the king." Now, it seems an excellent moment to explain the word hierothesion that appears in the above inscription. It comes from ancient Greek and literally means a "sacred seat". In the Kingdom of Commagene, this term was used to describe royal mausoleums. 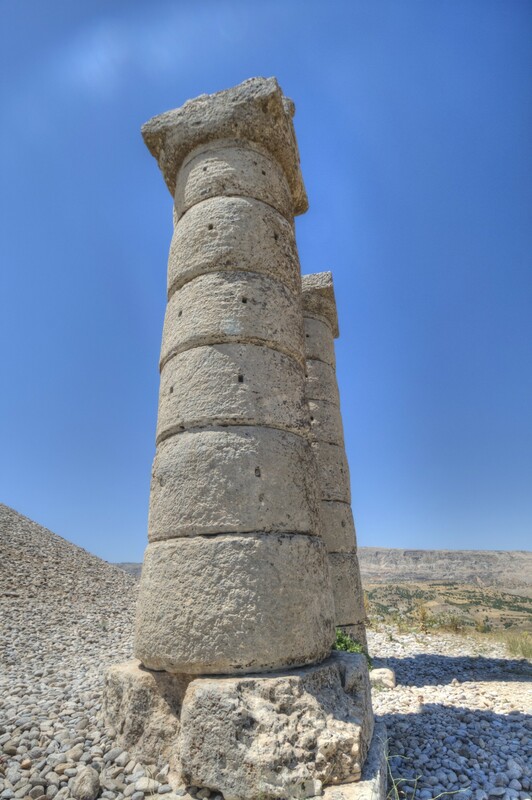 In particular, it was reserved for three burial sites: the hierothesion of King Antiochus I on Mount Nemrut, the hierothesion in Arsameia, erected by Antiochus I to his father, King Mithridates I Kallinikos, and the Karakuş Tumulus hierothesion. 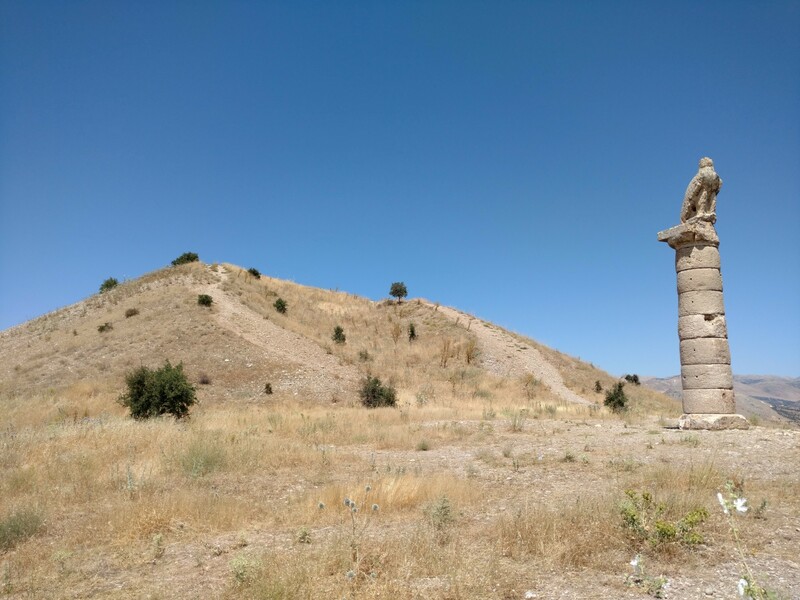 This last mausoleum was built by King Mithridates II, the son of Antiochus, for the women of his family, as we could read in the inscription quoted above. 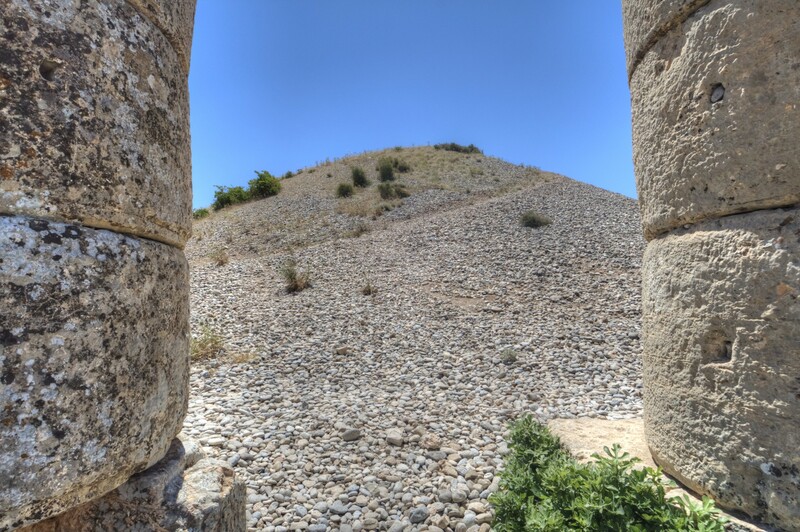 King Mithridates II ruled in the years 38 - 20 BCE and therefore the creation of Karakuş Tumulus is dated to this period. The figure of the ruler is visible on a relief placed on the column standing on the north-western side of the mound. This relief depicts Mithridates II shaking hands with his sister Laodice. However, some researchers, including T.A. Sinclair, claim that the person accompanying Laodice on the relief is not the Mithridates, but Isias - the mother of Mithridates and Laodice. The presence of Laodice on a relief placed on Karakuş Tumulus indicates that she was also buried in this family tomb. Laodice was married to the King of the Parthians, Orodes II, becoming the Queen of the Parthian Empire. 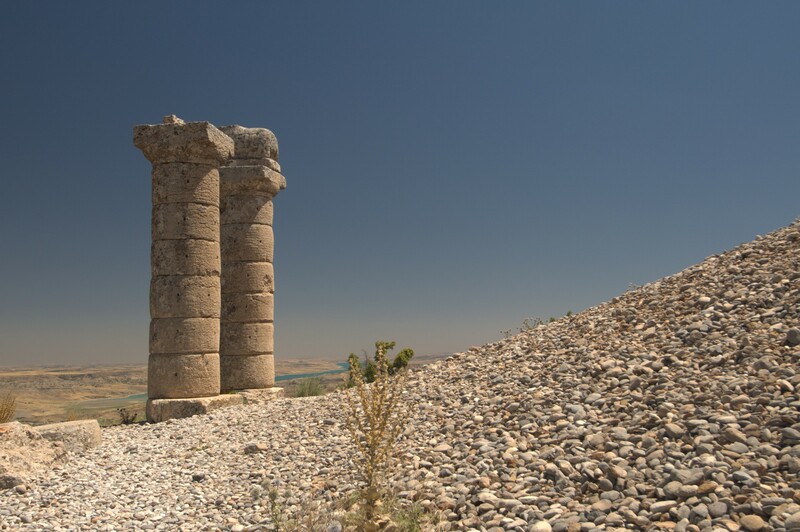 It was during the reign of Orodes II that the Roman army suffered a devastating defeat at the Battle of Carrhae - that is, the present Harran - in 53 BC. As a result of this defeat, the Roman commander Marcus Licinius Crassus, a member of the first triumvirate and most probably the wealthiest Roman of that time, lost his life. Roman reports say that the Parthians poured molten gold into his mouth as a symbol of his thirst for wealth. His head was sent to the Great King Orodes II and was allegedly used as a prop on the stage during the performance of Euripides' Greek tragedy The Bacchae. Let us return to Orodes's wife, Laodice. She lost her life along with her spouse and numerous royal offspring in 38 BCE when Fraates IV was proclaimed the successor to the Parthian throne. Orodetes's son quickly secured his position by murdering his father, stepmother and siblings. Laodice's body was brought back by her brother, Mithridates II, to the Kingdom of Commagene, and then buried in Karakuş Tumulus. It was not until 1938 that the researchers discovered a well-worn inscription placed on a column bearing a relief depicting a handshake between the royal siblings. It took another 40 years to decipher it, but now it is known that it reads: "The great king Mithridates, the son of the great King Antiochus and Queen Isias, dedicated this image to the indomitable memory of Queen Laodice, the royal sister and the wife of Orodes, King of Kings, and her own honor." Originally, many more columns surrounded the mound. 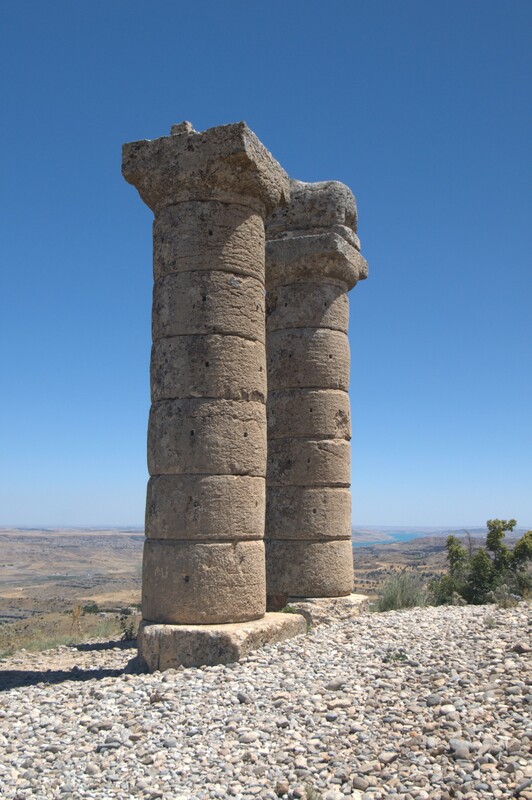 They stood in three rows of three columns each, on the eastern, southern, and north-eastern side on the tumulus. The central column of each group supported the relief block, and the two outer columns - the sculptures of animals - the deer on the eastern side, the eagle on the southern side, and the lion - on the northwestern side. 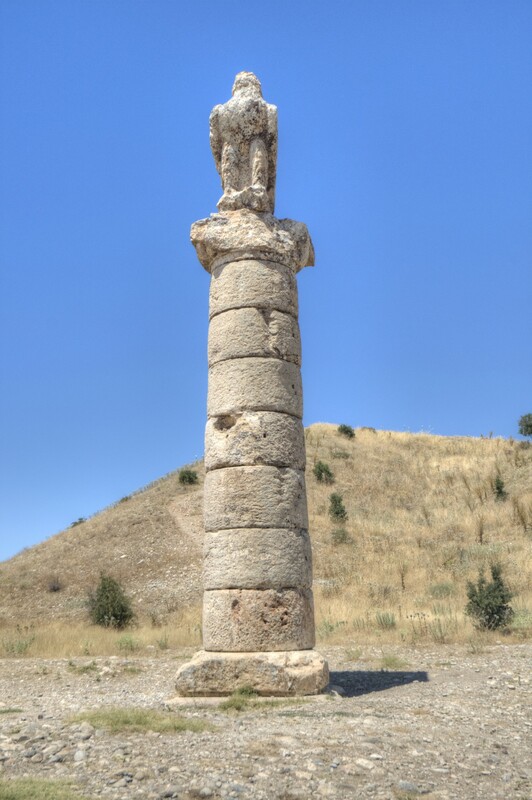 However, they were demolished and used to build the nearby bridge of Septimius Severus, now known as Cendere Köprüsü, at the end of the 2nd century CE. The principal archaeological works in the area of ​​Karakuş Tumulus were conducted by German researcher Friedrich Karl Dörner of the University of Münster. His work in the Kingdom of Commagene lasted from the 50s to the 70s of the 20th century. In 1967, he succeeded in discovering a burial chamber hidden beneath the artificial mound of Karakuş Tumulus. The hole was drilled vertically down from the peak of the mount. The drill touched the limestone plates forming the roof of the chamber. 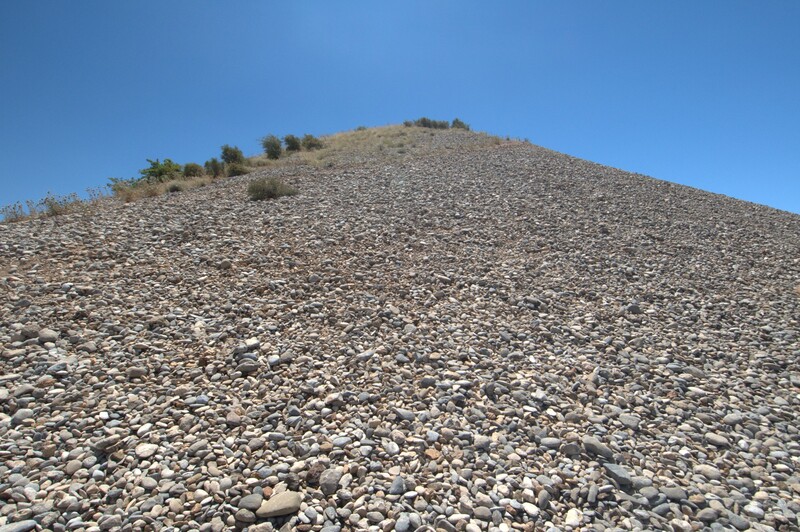 It is 13 meters below the top of the tumulus, and the floor of the chamber is another 7 meters down. To understand and visualise these dimensions it is worth remembering that the floor of the burial chamber is at the same level as the base of the eagle column. Unfortunately, the researchers did not find any objects or remains of people buried in this burial chamber. The room itself was filled with earth and sand, probably due to the collapse of the roof. Perhaps it happened even before the completion of the construction work, and in fact no one was buried in the tumulus. 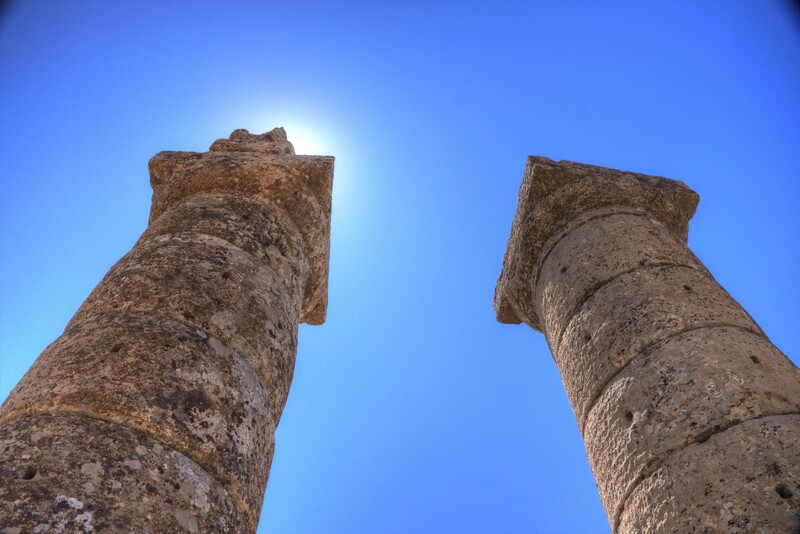 Friedrich Karl Dörner hypothesised that some of the building material from this chamber was already stolen in the Roman period, and used, like the missing columns, to construct the Septimius Severus bridge. 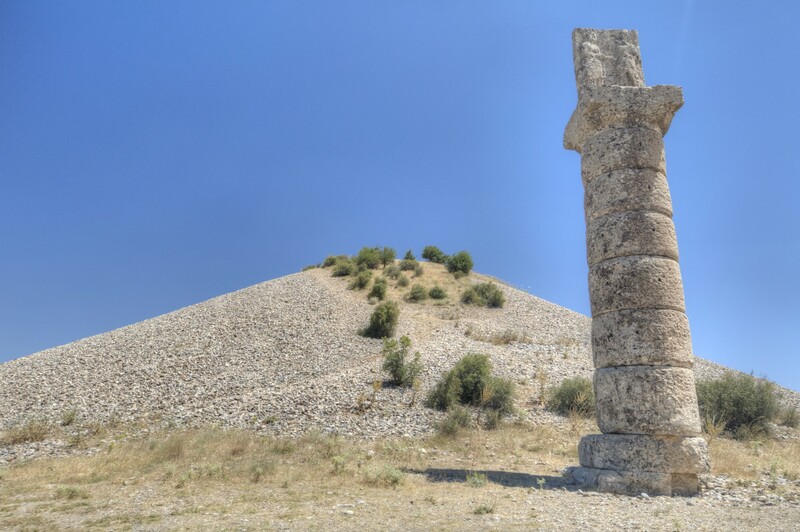 In 2017, the admission to the tumulus was free of charge. The area is not fenced so that you can visit at any time of day or night. Just below the top, there is a small restaurant offering refreshments and simple snacks. On a clear day, the top of Mount Nemrut is visible from the peak of the tumulus, 17 km as the crow flies in the north-east direction. 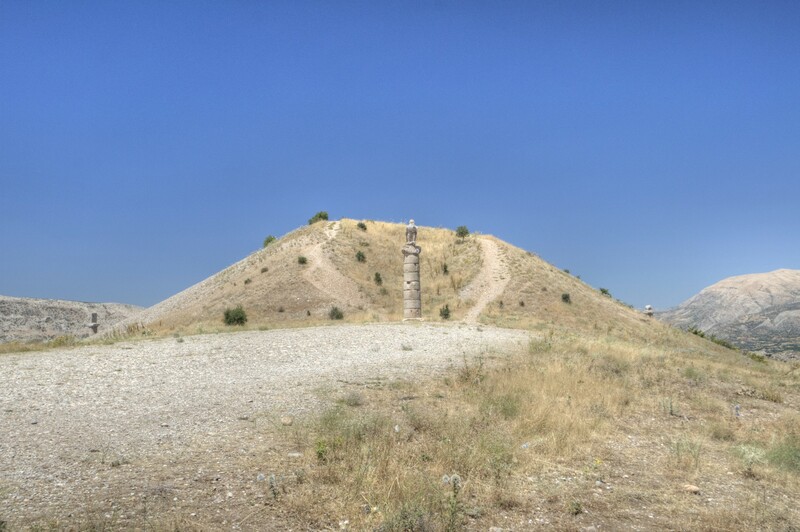 Basically, the access to Karakuş Tumulus is possible only by using your own means of transport. 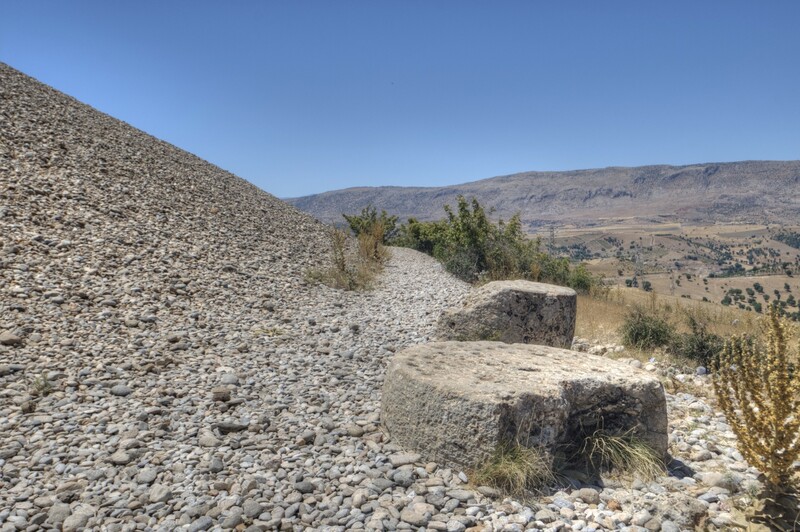 Fortunately, contrary to the claims made here and there that an off-road vehicle is needed, the drive to the tumulus is also feasible in a regular passenger car. 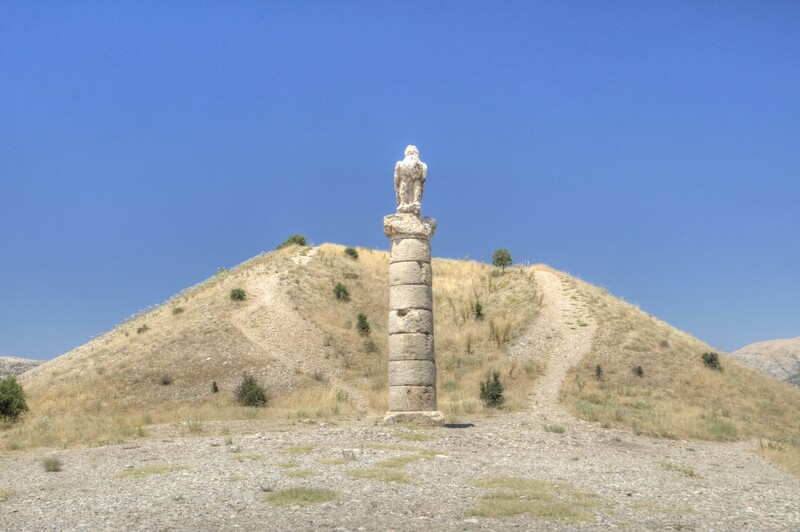 Karakuş Tumulus is just off the road from Kahta (10 km to the south) to Mount Nemrut National Park. 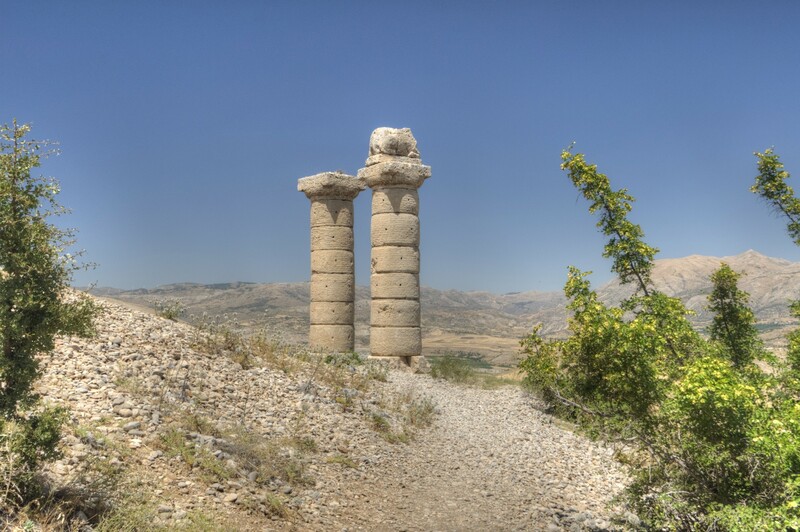 For those travelling in this direction, we recommend the following tour: Karakuş Tumulus, Septimius Severus Bridge, Eski Kahta Castle, Arsameia ruins, and Mount Nemrut peak at the end. 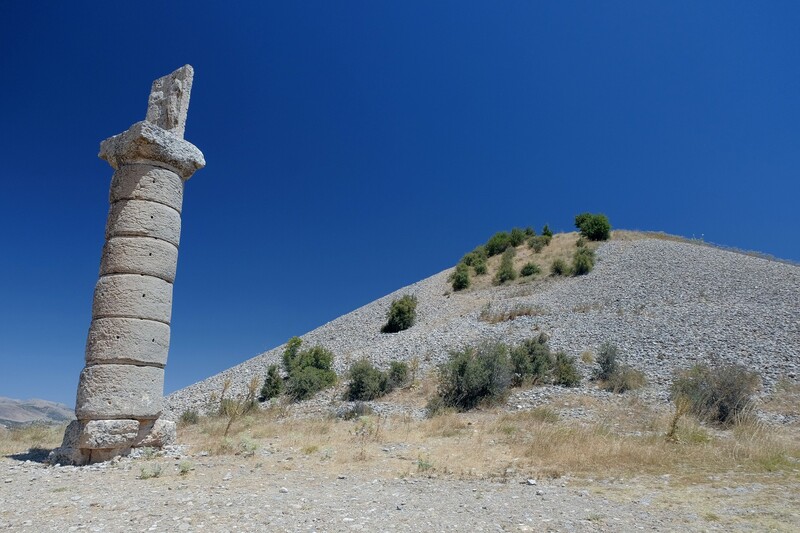 There are also travel agencies operating in Kahta that organise trips to Mount Nemrut, combined with visits to the above-mentioned sites.